Read below about two of our current research projects. 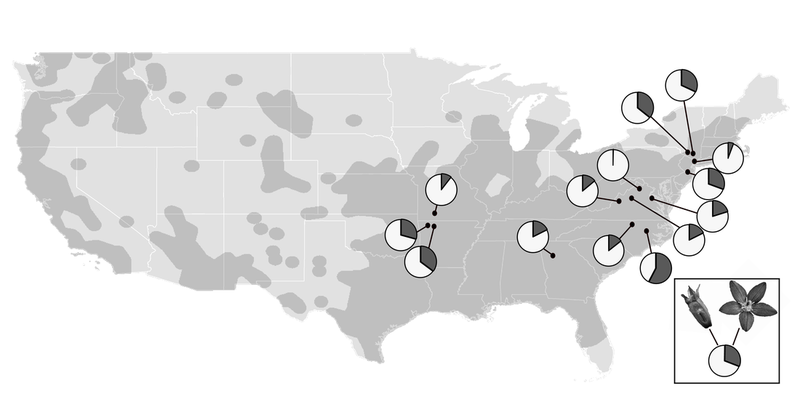 How does climate Change influence species at large spatial & temporal scales? Left: Peak flowering date has advanced in T. perfoliata over 153y of data spanning the US. Right: The relative influence of climatic factors in on peak flowering time using spatially explicit statistics. My lab is using a combination of methods to address crucial questions about how climate change influences plant populations. Most recently, we have been focusing on shifts in flowering time in the genus Triodanis. We currently have flowering time data for all seven species in the genus Triodanis, providing the potential to ask questions about how responses to climate change can vary among closely related species. I also plan on expanding this project into tropical ecosystems, for which we currently have very limited data. Some species in the genus Triodanis have ranges that extend well into S America, which affords the opportunity to draw comparisons between temperate and tropical ecosystems. Currently, most studies have focused on flowering time shifts in temperate ecosystems. But species in the genus Triodanis are experiencing both types of ecosystems, making this an excellent study system for understanding how flowering time cues may differ, and how the impact of climate change may vary between temperate and tropical ecosystems. My goal is to understand patterns and consequences of climate-driven responses in flowering time in species spanning the Americas. Do ecological, genetic, & genomic factors explain patterns of adaptive strategies? We are investigating the ecological and evolutionary consequences of self- and cross-fertilization within and among populations of Triodanis perfoliata (Campanulaceae). Individuals of this species exhibit both flowers open to cross-pollination, as well as cleistogamous flowers (those that do not open, but self-fertilize and set fruit). 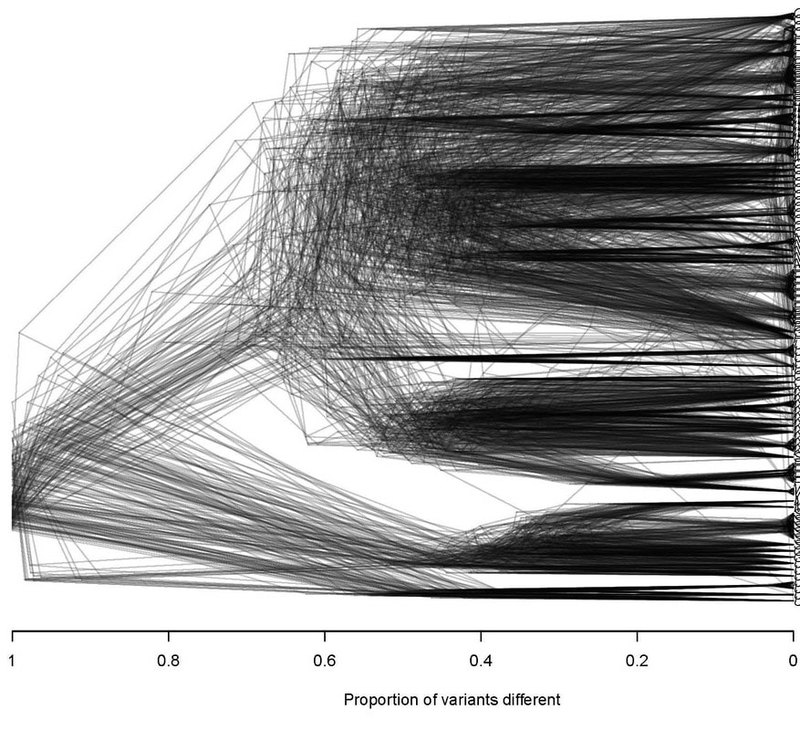 Figure showing overlayed phylogenetic trees generated from subsampling genomic data. 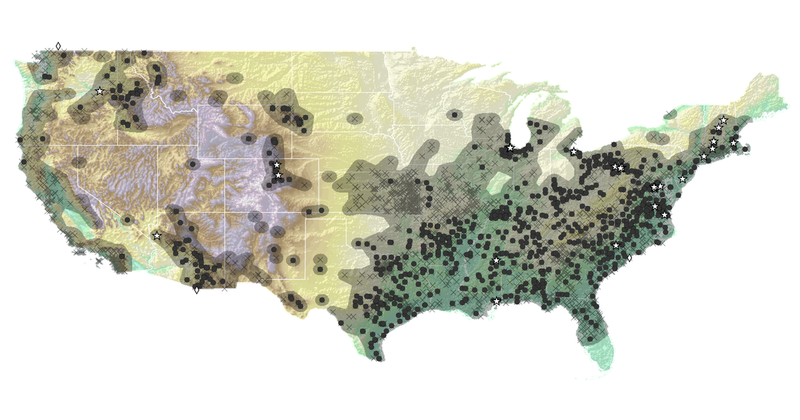 Phylogentics trees includes samples from 95 samples spanning 21 populations in 16 US states. 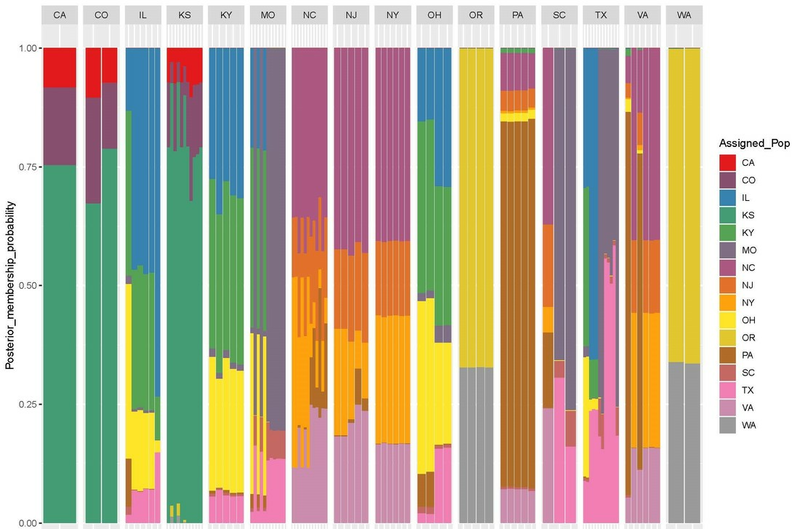 Figure shows (preliminary) probability of groupings within 16 US states based on genomic data.